Stand up paddle boarding is super easy to learn how to do, while being a serious workout at the same time. Aside from burning calories, stand up paddle boarding also gives you an incredible view of the water, and it can be a really fun group, or solo activity. But in order to make your stand up paddle boarding adventure the best it can be, you need to consider what makes a good paddle board, or what kind of paddle board is best for you! Considering the above factors will make choosing the inflatable stand up paddle board that’s right for you easier. But to help you along even more, we’ve compiled a list of the most popular and well reviewed inflatable stand up paddle boards out there! PORTABLE: When deflated and rolled up this SUP paddleboard is 1 foot in diameter by 35 inches. Easily stores and transports in carry backpack. When inflated is 10 FT long and 30 inches wide. RIGID CONSTRUCTION: Can hold up to 350 pounds. When fully inflated the board feels like your standard non-inflatable paddleboard but much lighter. What makes the Driftsun so special? This inflatable board has been described as performing like a hard board. That basically tells you that this wave is going to make staying upright while taking on waves a breeze, while you still get all the pros of an inflatable! The Driftsun SUP Inflatable 10′ Stand Up Paddle Board is comes with an adjustable paddle that reaches a full length of 7 feet, making it a good choice for the taller stand up paddle boarders ut there! While you probably won’t need it, because this inflatable board is constructed out of military grade PVC, you will also get a patch and repair kit with your purchase, as well as a PSI gauge hand pump and detachable fins. This inflatable board inflates and deflates in under 5 minutes, making it a time saver! While this inflatable only weighs 28 pounds (or just under 13 kilograms) when completely inflated, it can hold up to 350 pounds (or just under 114 kilograms), perfect for paddlers that enjoy taking their furry pals out onto the water. 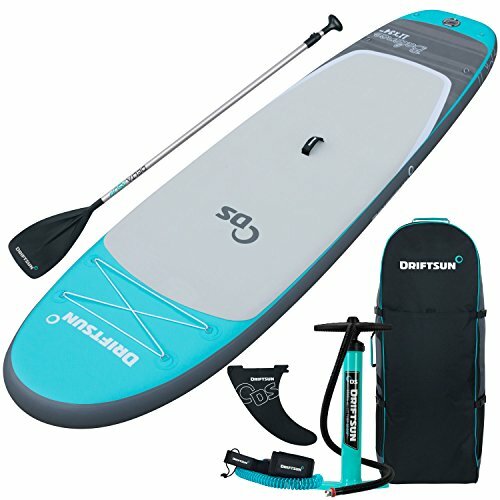 Overall, the Driftsun SUP Inflatable 10′ Stand Up Paddle Board is an impressive, rugged board that comes at a fair price. What makes the Vilano Navigator so special? This board is 31 inches wide and 6 inches thick, making for ample balancing space and a sturdy, stable board. 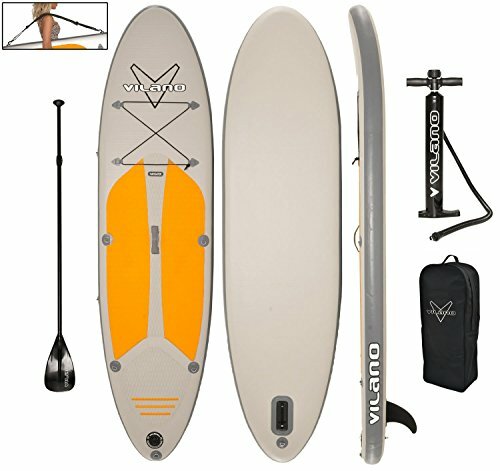 The Vilano Navigator 10 inch Inflatable Stand Up Paddle Board comes with a detachable shoulder strap that makes carrying the board while it is inflated really simple. It also comes with an integrated pressure gauge pump, an adjustable aluminum paddle and a carry bag. This inflatable board is definitely built to last, the Korean drop stitch construction out of high grade PVC makes this inflatable board almost indestructible! The D rings and bungee cord on the deck of this board make storing gear for longer days on the water simple, and making these days even more comfortable is the anti slip deck pad. Overall, the Vilano Navigator 10 inch Inflatable Stand Up Paddle Board is some serious bang for your buck. This is a definite low range price for a high quality inflatable board! And to top it all off, this board comes with a 1 year warranty that covers material and workmanship. What makes the Atoll so special? This board is 30 percent lighter than other comparable inflatable boards, while remaining incredibly rigid while fully inflated! The dual layer OVC also makes this board almost impervious to any possible punctures or tears. 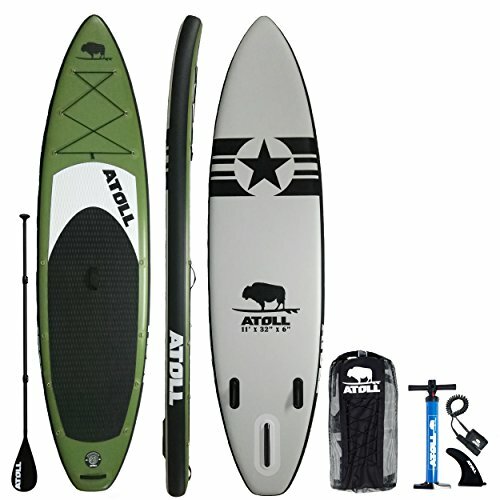 The Atoll 11’0″ Foot Inflatable Stand up Paddle Board is sold alongside a 10 foot extra tough poly flex leash, an adjustable aluminum alloy oar, bungee straps for the securing of your gear, an extra durable and removable fin, a repair kit, a hand pump, and a heavy-duty nylon carry backpack to carry it all in. The deck of this board is 32 inches wide and 6 inches thick, which means that this is one sturdy board that can carry a full grown man and a small or medium sized dog safely and comfortably. The molded in handles make this board really easier to carry from point A to B. Overall, the Atoll 11’0″ Foot Inflatable Stand up Paddle Board is fast, flexible and reliable, and it comes with a 2 year warranty! This inflatable stand up paddle board is a bit on the more expensive side, but it is so worth it! STABILITY FOR FITNESS - Wider nose and tail designed for maximum stability on the water. Larger EVA traction pad offers a comfortable and stable platform ideal for fitness enthusiasts, SUP Yoga, or simply cruising the bay! VIRTUALLY INDESTRUCTIBLE - Constructed out of incredibly tough military grade drop stitch PVC | 6 Thick | No more dings or cracks with this ultra durable board. What makes the Driftsun Balance so special? Stand up paddle board yoga has become a really popular pass time, as it’s a killer work out in the most incredible environment! If you are really experienced and are going to be doing some challenging yoga poses on your board, you are going to need balance and support. This board is constructed out of the strongest military grade PVC. The Driftsun Balance 11 Yoga SUP Inflatable Stand Up Paddle Board is 33 inches wide, giving you all the space you need to practice yoga with all the support you need. This yoga board is sold with, among other accessories, a collapsible aluminum oar, a removable fin, a repair kit, a high pressure pump and a bag with rolling wheels to carry it all around in! The weight capacity of this yoga board is an impressive 400 pounds (or just over 181 kilograms). This yoga board is easily transportable and comfortable. Overall, the Driftsun Balance 11 Yoga SUP Inflatable Stand Up Paddle Board is mid range in terms of pricing and it comes with a 1 year warranty which should give you extra piece of mind, even though we bet you don’t need it! Exclusive sport design 11' Long x 30" Wide x 6" Thick weight limit up to 385lbs board weight 22 lbs. What makes the iRocker so special? This board is relatively average sized, being 11 foot long and having a deck of 30 inches, but it’s the 6 inch thickness that make this inflatable stand up paddle board feel as stable and sturdy as any rigid board. The iRocker Inflatable SPORT Stand Up Paddle Board is really tough, something that you should be looking for in an inflatable board. This board is made up of triple layer military grade PVC, protecting it from scrapes, tears and punctures. The overall shape of this inflatable board makes it way speedier than others, perfect for those stand up paddle board thrill seekers! 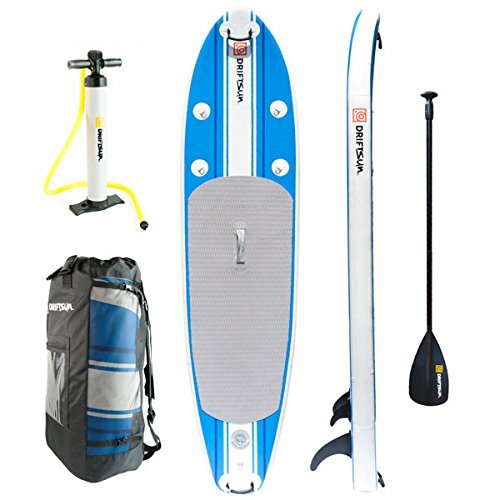 This board is also sold along with a dual action hand pump with an integrated pressure gauge, a floating and adjustable aluminum paddle, and a backpack with adjustable shoulder straps. 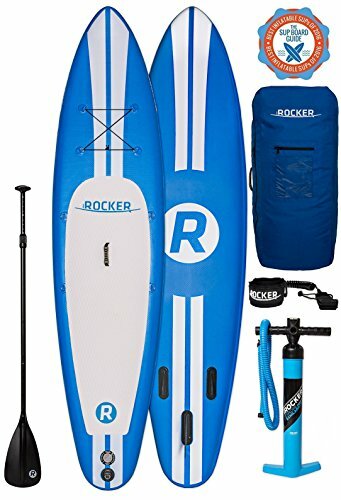 Overall, the iRocker Inflatable SPORT Stand Up Paddle Board is a well priced mid range inflatable board, and the perfect blend of speed and stability. This board also comes with a 30 day return policy. What Makes a Good Inflatable Stand Up Paddle Board? When it comes to inflatable boards, the most important aspect is probably durability. Because these inflatable boards are not made of rigid materials, there will always be the risk of your board being torn or punctured, whether fully inflated or deflated. You need to pay attention to what exact materials your inflatable stand up paddle board is constructed of, and be sure to choose those made with the most robust materials. Some may be hesitant to purchase an inflatable stand up paddle board because you have to inflate and deflate it. This is a double edged issue as the inflation and deflation does take up time, but the storage space required for a deflated stand up paddle board is almost nothing compared to the storage space needed for a rigid one! Rigidity is not an adjective that most people would associate with an inflatable anything, really, but you will find that most inflatable stand up paddle boards are actually almost just as rigid as non inflatable boards! The rigidity enables you to keep control of yourself on the board without having to compensate for any softness.